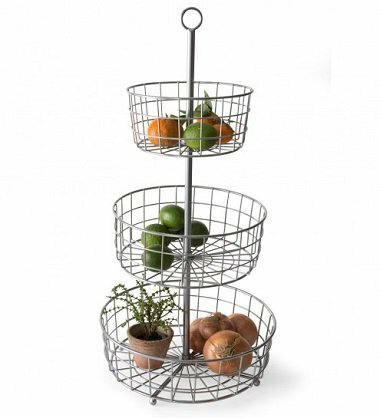 A decorative and useful kitchen item such as the 3 tier wire fruit basket stand not only adds to the decor but is also handy and functional, another great housewarming gift idea. A most beautiful fruit and vegetable display stand, the 3 tiered fruit basket stand looks really sophisticated and elegant on your table top. Your family as well as visitors would surely be tempted to help themselves to the colorful fruits on display. The 3 tiered wire basket design allows for maximum air circulation thus ensuring that your fruits and vegetables stay fresh for a longer period of time. Measuring approximately 29” height x 14.25″ diameter, this versatile metal fruit basket stand makes a lovely centerpiece on your kitchen top. With 3 tiers, you can organize your fruits and vegetables for easy access. It is portable and very practical. This aesthetically pleasant looking metal wire fruit basket stand is a great way to encourage snacking on healthy fruits. The stylish tiered design is durable as well as stable and does not tip or topple easily. It is a sturdy piece of kitchen fruit stand. This elegant fruit stand when filled with colorful fruits and vegetables adds a bright and colorful decor to your kitchen. You can also use it to hold your pretty flowers or ornaments for a themed holiday display. 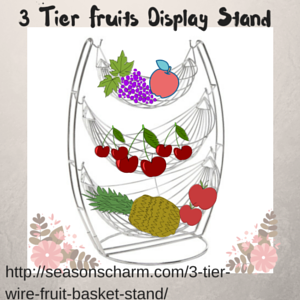 Give this useful 3 tier wire fruit basket stand as a housewarming gift and it will be well received.